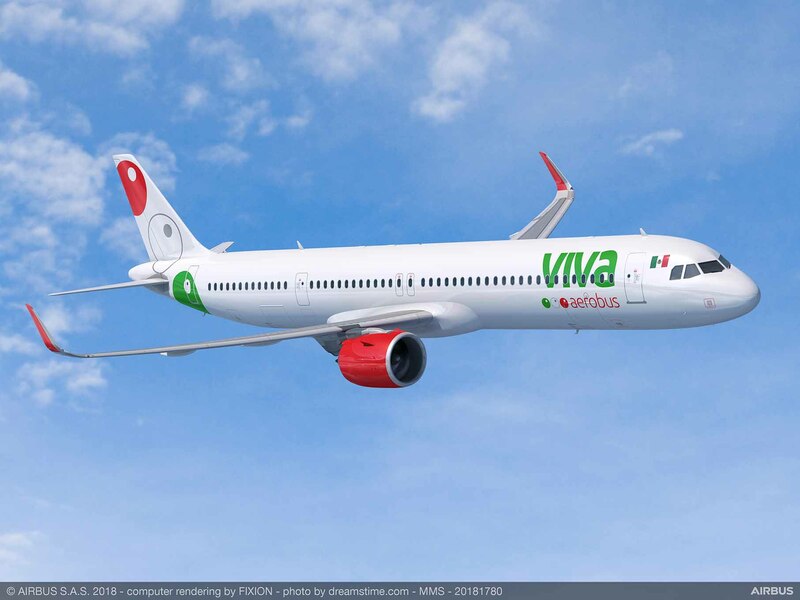 Mexico City; July 18, 2018.-Viva Aerobus, Mexico´s ultra-low-cost airline, today announced the purchase of 25 new Airbus A321neo aircraft. This order is added to the existing order made in 2013, when the company ordered 52 Airbus A320 aircraft, as well as the purchase of 3 additional aircraft between 2016 and 2017. In addition, Viva Aerobus converted 16 A320neo aircraft, corresponding to the 2013 order, to the A321neo model. Considering both orders, Viva Aerobus will acquire a total of 80 aircraft: 15 A320ceo, 24 A320neo and, now, 41 A321neo. The remaining aircraft to be delivered by Airbus increases from 36 to 61, with deliveries to 2025. With this historic transaction, with list price of $3.5 billion dollars, Viva Aerobus renews and expands its fleet, endorsing its commitment to continue offering the lowest fares. "This investment reflects the confidence of our shareholders, employees and passengers in Viva's business model and represents a step forward in the consolidation of Viva Aerobus' firm, continuous and disciplined expansion. The increase of our fleet confirms our commitment to Mexico, to the potential of the market and to the economic development and tourism of the country", said Gian Carlo Nucci, CEO of Grupo Viva Aerobus. This is the second largest purchase of the company behind its previous order of 52 aircraft in 2013, operation worth over $ 5 billion USD. It is the first time that Viva Aerobus will operate the A321 model, with a capacity up to 240 passengers (54 more seats than the A320); this aircraft offers greater operational efficiency, more comfort for travelers and enriching their flight experience. "The golden rule of the true ultra-low-cost proposition is to demand the highest operational efficiency. The A321neo, which has the latest advances in aerodynamics, fuel consumption and in cabin innovations, will reduce the total cost per seat by, at least, 15%. This means a direct benefit for passengers, since this advanced technology will allow us to continue offering the lowest fares in the market, strengthening our mission to always be safe, always reliable and always low fares", said Juan Carlos Zuazua, CEO of Viva Aerobus. Viva Aerobus will receive the first Airbus A321 in 2020 and, with the remaining 79 aircraft delivered by 2025. Currently, Viva Aerobus operates a fleet of 26 Airbus A320: 22 with ceo technology (Current Engine Option) and 4 neo aircraft (New Engine Option). In this sense, the airline has shown strong results in terms of growth due to travelers’ preference, reporting a 23% increase in the number of passengers during the first half of the year, compared to the same period of 2017. Likewise, on average, Viva Aerobus has a 90% load factor, one of the highest levels in Mexico and the world. Viva Aerobus is Mexico's low-cost airline. It started operations in 2006 and today operates one of the youngest Latin American fleet with 26 Airbus A320, including four A320neo on 95 routes and 41 different destinations. With a clear vision to give all people the opportunity to fly, Viva Aerobus has democratized the airline industry with the lowest rates in México and the lowest costs in Latin America, making their flights the best value offer. Walfred Castro, Corporate Communications Lead, Viva Aerobus – walfred.castro@vivaaerobus.com. Tarssis Dessavre, Communications Consultant - PRoa Structura - tdo@proa.structura.com.mx – Tel. (+52.55) 5442.4642 - ext.26 / Cel. (044.55) 2751.1709.